Okay, that was far more interesting than it ever should have been. 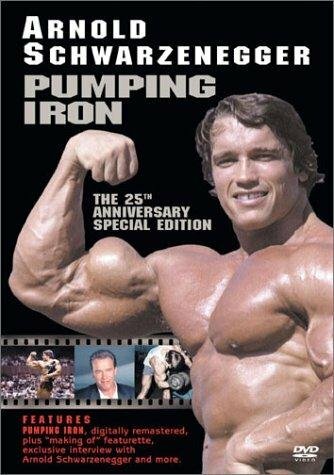 I added Arnold's bodybuilding work as some way to pad the numbers for this series since his standard filmography wouldn't expand the month of November. So I figured, why not start with the biggest of them all, the documentary that really put Arnold on the map: Pumping Iron. Having read this part in his autobiography already, none of the events really shocked me but it was fun to see them actually played out rather than just reading about it. Here Arnold comes across as an overconfident prick but it's hard to view him that way. His actions are questionable but from a competitive standpoint, he's just trying to get any advantage his can, and because of his smarts, his big advantage is a mental one. His interactions with Ferrigno are classic. You can just see him trying to psych him out and doing so in the biggest of ways. Makes me more impressed with Arnold on a mental level. The entire movie is filled with impressive individuals though. Anyone who can train that much, every day for years and years gets my respect. I know I could never do that. But yeah, I can't say the film is for everyone. I found it more interesting due to it's look at the human condition but the subject matter itself may turn some people off. I'd highly recommend it though because it certainly gives the sport of bodybuilding more dimension than it lets on, on the surface.